News from the North Atlantic LCC: A new paper published by a team of scientists from the U.S. Geological Survey and U.S. Fish and Wildlife Service in Ocean & Coastal Management synthesizes existing information on ecological thresholds related to environmental changes — including sea-level rise and coastal storms — for 45 species of coastal fish, wildlife, and plants selected because of their ecological, economic and cultural importance. 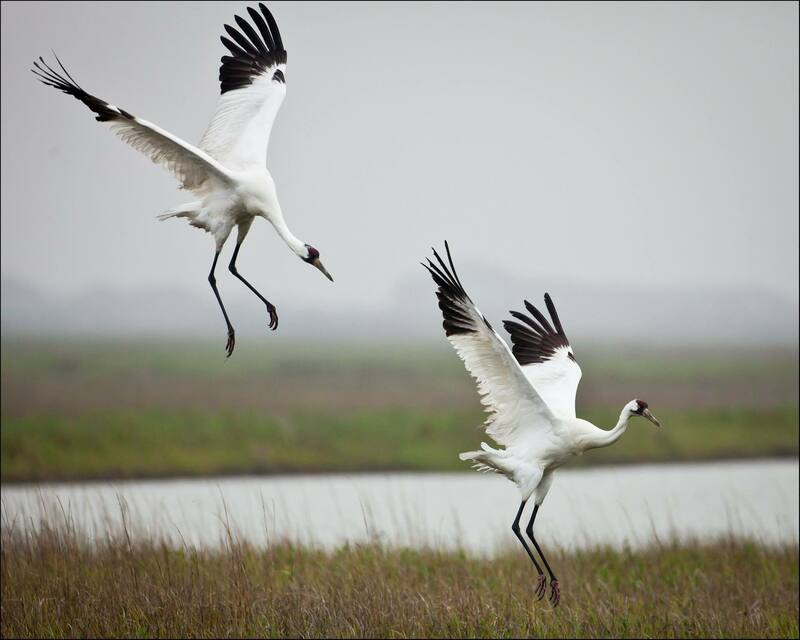 Coastal systems like salt marshes, mangrove forests, and barrier beaches are home to a diversity of wildlife species, such as whooping crane, Eastern oyster and American black duck. These species are important parts of functional ecosystems that contribute a host of economic, recreational and cultural benefits to people and communities. For example, the Eastern oyster is a cornerstone of a lucrative shellfish industry, filters water as it feeds, and helps stabilize the shoreline by creating reefs. Healthy coastal marshes are the nursery areas for fish species that support critical recreational and commercial coastal fisheries. Some species also play an instructive role as indicators of environmental changes that can threaten coastal systems people and wildlife depend upon. These indicator species may experience “ecological thresholds” – the tipping points at which changing environmental conditions will lead to a disruption in a species life cycle or habitat. By looking at ecological thresholds for key species, we can better prepare for and respond to threats that can affect their homes – and ours. A team of scientists from the U.S. Geological Survey and U.S. Fish and Wildlife Service collaborated to synthesize existing information on ecological thresholds related to environmental changes, including sea-level rise and coastal storms, for 45 species of coastal fish, wildlife, and plants selected because of their ecological, economic and cultural importance. Published in Ocean & Coastal Management, their new paper “A synthesis of thresholds for focal species along the U.S. Atlantic and Gulf Coasts” offers insights on strategies for managing coastal resources to help managers make the most effective decisions today to protect natural systems that sustain wildlife and the health and well being of people and communities. The synthesis responds to a need identified by stakeholders from six LCCs, three CSCs, state wildlife agencies and other partners from across the U.S. Atlantic and Gulf Coast regions for information on thresholds that can help managers act strategically despite uncertain future conditions. This information is timely for helping coastal states implement updated State Wildlife Action Plans (SWAPs), which identify species of greatest conservation need in each state and outline strategies for protecting them in the face of challenges. All of the SWAPs in coastal Northeast states identify environmental impacts to species in the coastal zone as one of the greatest and most actionable shared threats in the region. All of the species in the paper had either been identified previously as vulnerable to sea-level rise or storms, as representative species for others with similar ecological needs and sensitivities, or as Species of Greatest Conservation Need in SWAPs. Some, like saltmarsh sparrow, fulfill all three criteria. The synthesis revealed that there are disparities in the quality and quantity of information that is available to help managers act strategically to protect these species and others with similar habitat needs from changing environmental conditions. While there is information on ecological thresholds for more than half of the focal species, the information ranges from estimates of the percentage habitat loss or gain under different sea-level-rise scenarios, to numeric metrics that indicate how a species will respond to a specific environmental change. 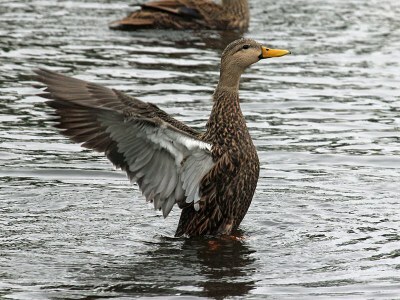 For example, salinity levels greater than 9 parts per thousand can negatively affect the growth and survival of the mottled duck, a species that depends upon marshes along the Gulf Coast for nesting habitat. Sea-level rise can increase the salinity of coastal marsh habitats through greater tidal intrusion, and more frequent and severe coastal storms can also increase inundation and salinity. Therefore, protecting or creating brackish marsh habitat with salinities less than 9 parts per thousand is important for the survival of the mottled duck and other species with similar habitat requirements. Although the numeric metrics offer a precise way to determine when a threshold has been crossed, percentages of habitat loss or gain in response to different levels of sea-level rise, known as “scenarios,” still represent valuable opportunities to inform where and how managers can take meaningful action – even in the face of uncertainty. “By pairing quantitative thresholds for highly vulnerable species responses with sea-level rise projections and coastal landscape responses, managers can prioritize which species need immediate action and timelines to reach conservation goals,” explained co-author Michelle Staudinger, Science Coordinator for the Northeast CSC. While robust decision making is best supported by two or more threshold metrics across life stages or geographical regions within a species’ range, effective strategies can still be crafted when only a single threshold metric is available. The authors discuss a variety of coastal adaptation strategies in the paper to illustrate how threshold data can be applied to help increase the persistence and resilience of vulnerable coastal species. This work was supported by The Department of the Interior Northeast Climate Science Center, which is managed by the USGS National Climate Change and Wildlife Science Center. 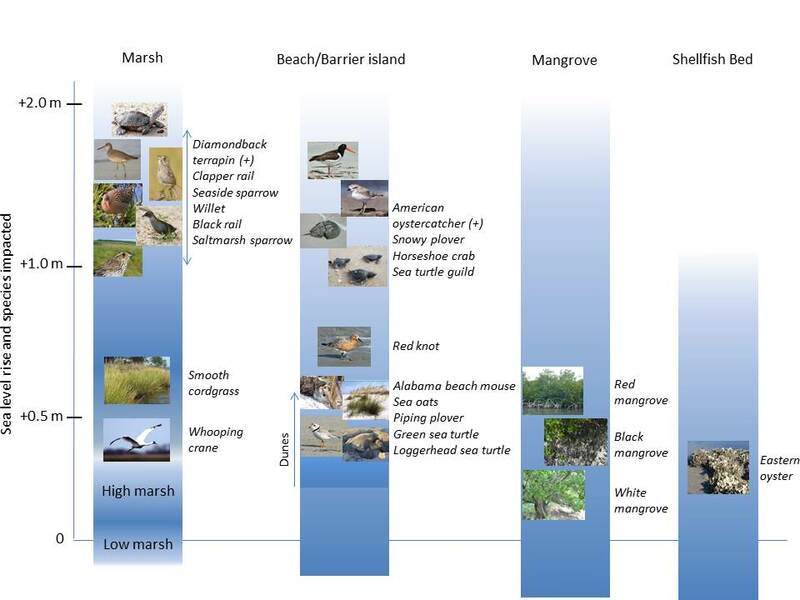 Species’ relative vulnerability to sea-level rise (SLR): A snapshot of impacts from sea-level rise within marsh, beach/barrier island, mangrove, and shellfish-bed habitats based on a literature review of species thresholds. Locations of the species/guilds along the vertical axis represent approximate levels of SLR at which species are expected to be impacted according to the literature. Species are listed as being relatively more (bottom) to less (top) vulnerable within each group. Two species may experience habitat gains associated with SLR, denoted by a “+”, and may be most resilient to SLR. 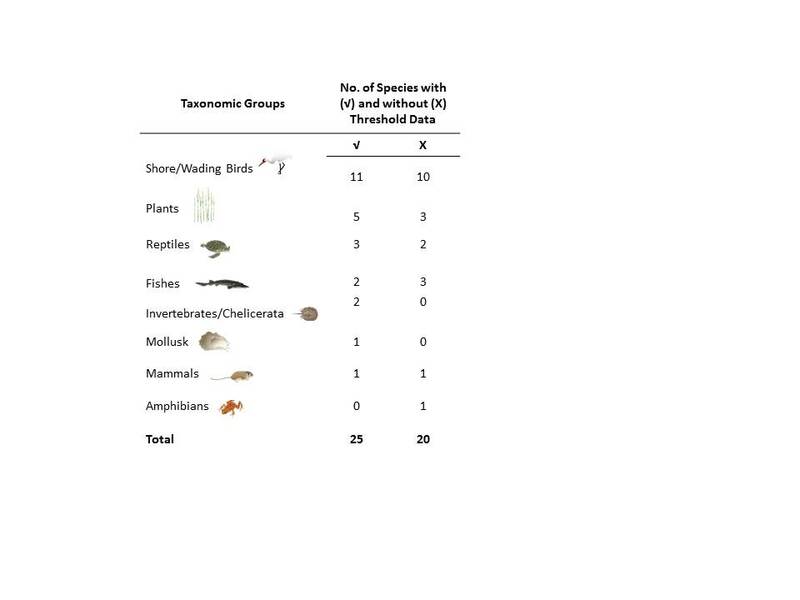 Table of data available by taxonomic group: Summary of the total number of species per major taxonomic group with and without quantitative threshold data related to SLR and coastal storms. Bridget provides communications support for the North Atlantic LCC, and writes about the work partners are doing to advance conservation science and action across the region in the face of climate change and development.